Nice vibrant colors. Overwhelming center piece. 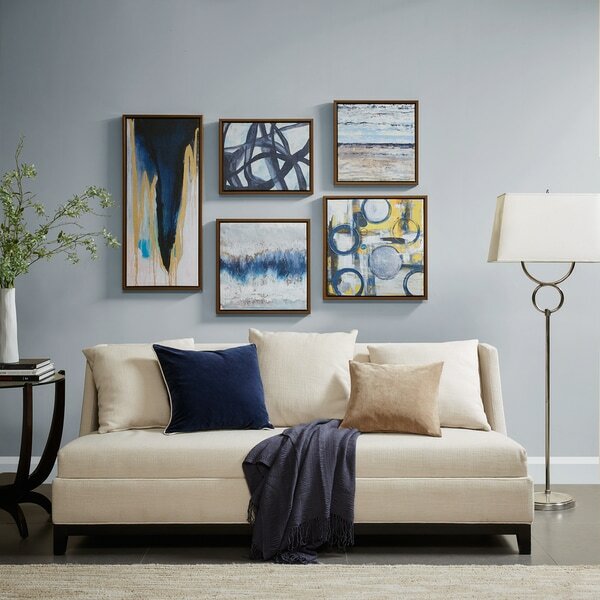 Instantly create a contemporary gallery wall with the Blue Bliss art set by Madison Park. 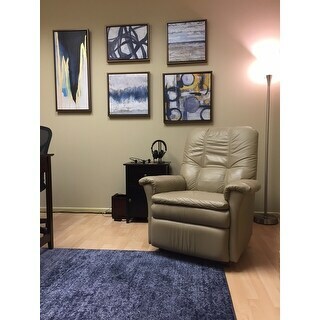 This chic 5-piece set includes gel-coated canvases with abstract designs in modern hues of grey, blue, and yellow. Arrange the bronzed frames to suit your space and enjoy your new, gallery-ready look. I tried to create a gallery wall myself and just couldn't pull it off. This made things so much easier and it looks fantastic. I didn't worry too much about perfect placement as long as you get it generally close. The quality of the frames is great and you will not be disappointed. I would give this 10 stars if I could. I seriously cannot believe how nice this set is, given the amazing price! A picture speaks a thousand words - below is how the set looks in my studio. You can tell the set is not true canvas up close but the material is still nice and well made - they will last. 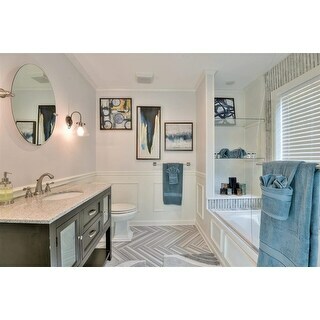 The abstract patterns are very classic and the five pieces go very well together. I'm so glad I got to have my own gallery wall without spending a thousand bucks and dealing with the headache of gathering different art pieces! Thank you overstock! The Madison Park Blue Bliss art piece is hung in our den. It is a beautiful addition to the light gray ways and dark hardwood floor. We have a navy blue area rug in the room and the blue hues in the artwork is perfect. It is a nice size collection of artwork to hang on a large wall behind the desk. The quality was superb and I love it. The delivery time was exceptional. Thank you Overstock ! Wow! Larger than I expected, great quality and beautiful pieces! 3 pieces went over my bed, the other 2 on my other wall. I would recommend highly. Madison Park has great quality products, just bought a coverlet by Madison Park. 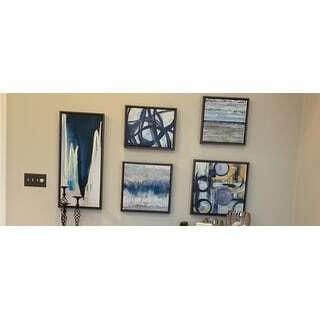 Great modern gallery wall assortment with perfect modern color scheme! Very happy to find this on Overstock to save me having to find several small pieces for a gallery wall. Nice quality set! Looks perfect in my blue/white/gold reading room! Fast shipping. If you need a lot of art on a budget this is a great option. I got this set to fill out the art in a vacation place and this worked great. I actually split up the set. The vertical piece is plenty large enough to use as a stand alone piece at the end of a hallway or narrow wall. It looks really nice. I also like how they are framed. It makes them look much nicer than just plain printed canvases. I love abstracts and was thrilled to find these. People cannot believe what I paid for them. They are a great value. 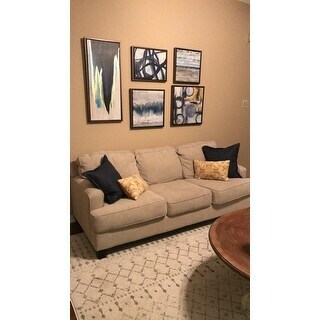 The frames are a bronzy brown color which goes well with dark brown furniture and some of the canvases have texture so you can almost think that they are real paintings. They go well with the Unique Loom Charlotte Del Mar Area Rug, also sold at Overstock. I compared prices on both of these items before purchasing and they had the best. Thanks, Overstock! I love this set. Wow! 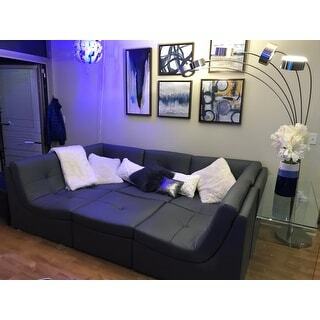 A great bargain for the price and they look great in the space. They are actually a little bigger than I had anticipated, so I could only get three in a grouping. The others found homes on a different wall and a bath shelf, the great part about that is that they still really coordinate--now it just draws your eye to various places, rather than just the one wall. I had to wait a little bit for these, but it was so worth it. I absolutely love this. It looks amazing in our living room. I couldn’t be more pleased. Have to tell you. Exactly as shown. Totally in love with this set! These are so pretty and amazing quality. Really great purchase and blues and golds are so pretty. A must but! Amazing quality and they look even better in person. Took me about 15 minutes to hang everything after careful measuring and I love it. 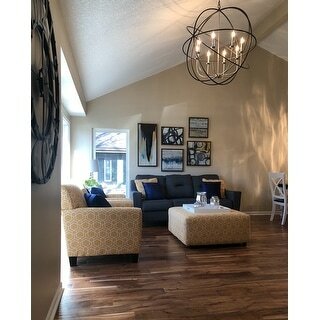 These look amazing in my living room! 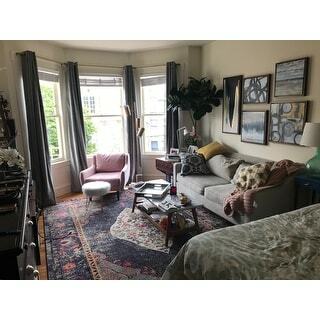 Really good quality and style. 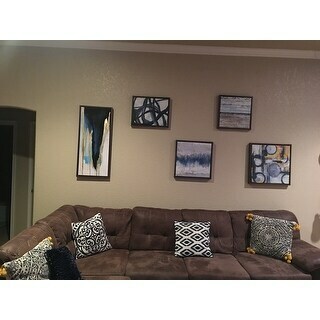 These paintings are one of my favorite things in my new house! :) They look exactly like they are shown online. I would definitely recommend. I needed art work to go with my navy living room. This was perfect because I didn't have a lot of money to spend. I had a large wall to decorate and this piece was perfect. I had to spread the out a little to cover more wall but I am very pleased. Gorgeous colors and exactly what I was expecting. They seem to be great quality. Overall, they look great as coordinating pieces in my bedroom. Love this collection! It matches my color scheme in my living room perfectly. 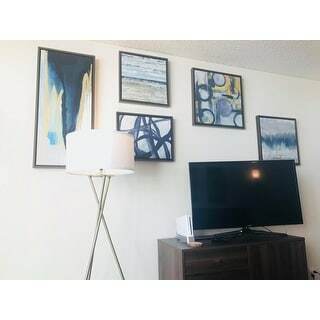 I hung them similarly to the way that they are shown in the photo. Delivery was on time and packaging was superior. I am absolutely satisfied with my purchase! The pictures are a perfect fit! The frame is sturdy and looks sleek. The painting texture appears of quality and is evenly painted/printed (I’ve received some that when through the printer unevenly leaving one side of a painting lightly dusted and the other side inked/painted appropriately). 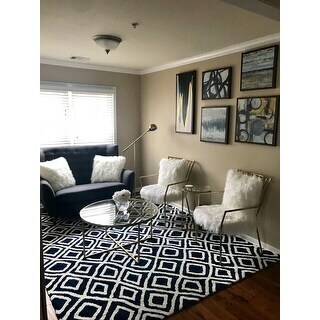 The painting fit my decor (boho/minimalist) great and from other reviews are very versatile. Don’t hesitate! Looks ok. Not as pretty in person. "The description of the frame says "grey" but the photo looks brown. Will you please clarify the actual color of the frame? Thank you." The frame I am looking at is also brown, will check with the partner. Is the frame grey or brown? Completes and frames the wall over my sons bedroom at a decent price. Looks like decent quality, low cost art work, and it had good reviews.